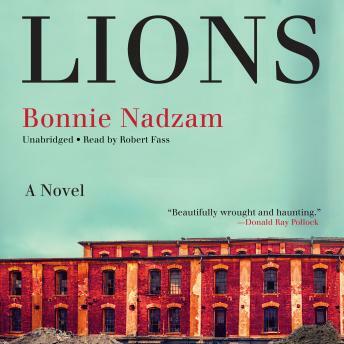 Bonnie Nadzam-author of the critically acclaimed, award-winning debut Lamb-returns with this scorching, haunting portrait of a rural community in a "living ghost town" on the brink of collapse, and the individuals who are confronted with either chasing their dreams or-against all reason-staying where they are. Lions is set on the high plains of Colorado, a nearly deserted place, steeped in local legends and sparse in population. Built to be a glorious western "city upon a hill," it was never fit for farming, mining, trading, or any of the illusory sources of wealth its pioneers imagined. The Walkers have been settled on its barren terrain for generations-a simple family in a town otherwise still taken in by stories of bigger, better, brighter. When a traveling stranger appears one day, his unsettling presence sets off a chain reaction that will change the fates of everyone he encounters. It begins with the patriarch John Walker as he succumbs to a heart attack. His devastated son Gordon is forced to choose between leaving for college with his girlfriend, Leigh, and staying with his family to look after their floundering welding shop and, it is believed, to continue carrying out a mysterious task bequeathed to all Walker men. While Leigh is desperate to make a better life in the world beyond the desolation of Lions, Gordon is strangely hesitant to leave it behind. As more families abandon the town, he is faced with what seems to be a reasonable choice and the burden of betraying his own heart. A story of awakening, Lions is an exquisite novel that explores ambition and an American obsession with self-improvement, the responsibilities we have to ourselves and each other, and the everyday illusions that pass for a life worth living.